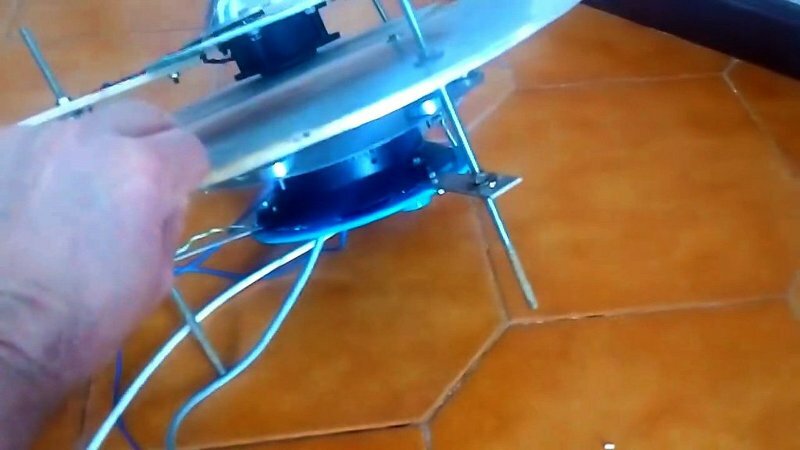 This thread has been started for the purpose of discussing and the building flying discs based on the demonstrations and information given by Alexey Chekurkov. So the frame is coming along, but I await certain parts and assembly. Picture shows a mock-up. I might have to increase the size of the threaded rods to a larger diameter, adjustments to make and parts yet to fit. The central plate, neutral plate or centre tap plate may play an important role. It may form a boundary for the positive and negative field. It’s also the position to apply the RF from the Tesla coil evenly to both halves of the device. 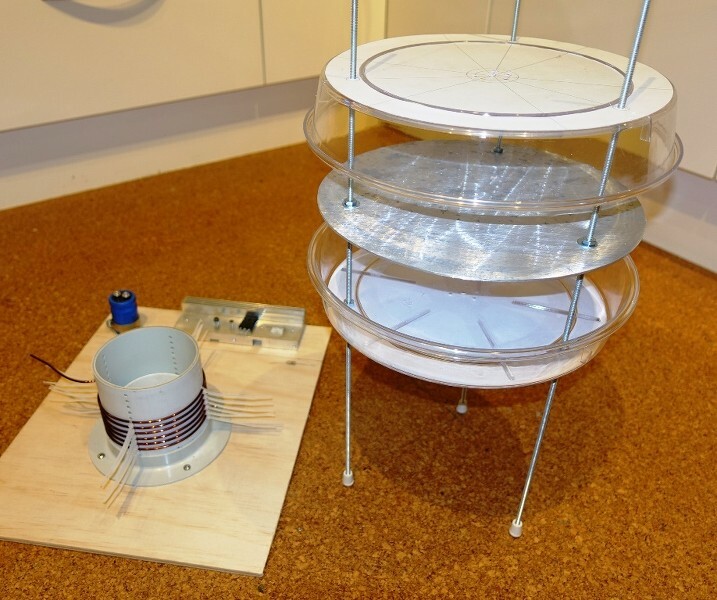 The primary coil for the Tesla Coil is almost complete, just the driving circuit remains. - I'll use the circuit Spigel used, (BSpg on the forum) using a 2SC5200 transistor. The important thing is that the Tesla coil feedback circuit self-adjusts for factors that alter the resonant circuit, (like capacitive loading) so it remains resonant at all times. do you have a link to the circuit schematic you plan on using ? It's great to see the Building Thread open and running! And yes I also have same questions as Space...and then some more.. 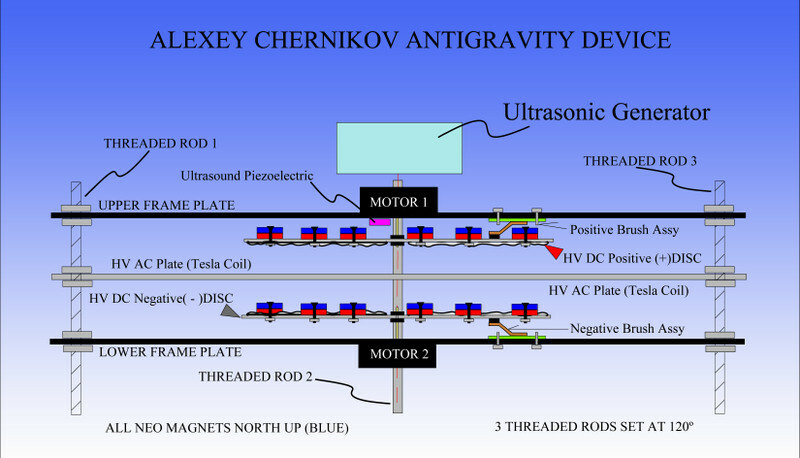 In Alexey's latest video, (if Google translator did the job right.. ) I believe next he would make the plates levitate (as he said he strongly believes there should be a much simpler method to make it)...maybe just with HV plus Ultrasound and some rotating field (magnets)...but where I want to get at...is to do some preliminary BUT SIMPLE tests...Which should give us some positive results...as to lead us the right way. Last edited by Ufopolitics; 09-26-2018 at 04:09 PM. Wunderbar! Everyone~ do not forget to up~vote this thread so that it is pinned. Glad to see this. Now Sputins I know you've going to be kept busy but what diameter did you decide on for the beetle plates? the reason is that it needs to be a field that is unequal from one spot to another (that would be why most things need 2 disks). so I tend to think that some component here is giving the thing direction. and I don't know how it has any direction. potentially a frequency shift or phase angle change from the HV AC to the ultrasonic ? first thing I would do to try and simplify it would be to make the disks unequal size as that is what at least 2 separate theories would point to. Then, in the case it would be so...by shifting this magnetic vector it may change angular displacement based on a virtual center axis where all magnets spin. Finally, like you've said...only having FIRST a working model....then adjusting these parameters to see which one is the directional component would tell the truth. Just returned from beating the local hardware stores for some aluminum plate and not one bit anywhere. The stuff Sputin's has was once commonly used as a material for the lower portion of summer time front door screens. If I can't find any aluminum plate I'm thinking plywood and crinkled aluminum glued to the ply might be the only other option besides a special order. I see that one of the disk's is made from plastic. I like the idea of using an ignition coil since that's something everyone can relate to and can be purchased off the shelf. Last edited by Gambeir; 09-26-2018 at 10:39 PM. 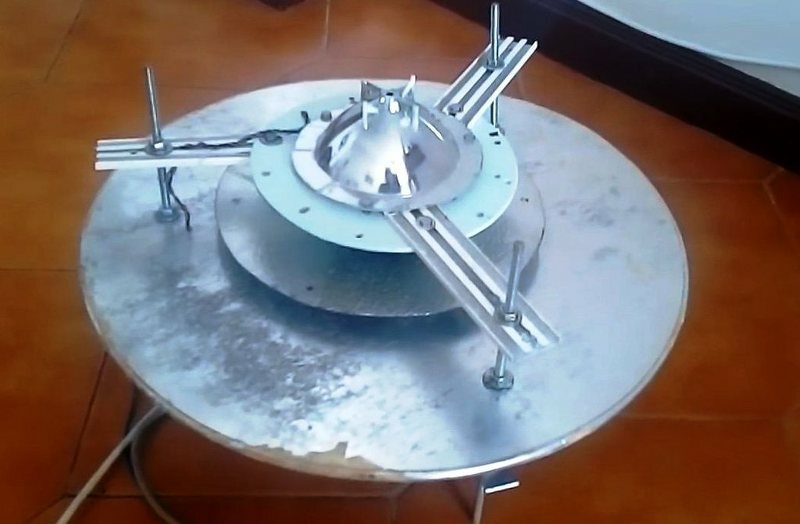 Could the center plate be functioning as a ground to counter space through the magnetic fields? Think about it, the HV is above, the magnets below and spinning to form a what? I think the magnetic field spin is creating a ground. Last edited by Gambeir; 09-26-2018 at 11:03 PM. 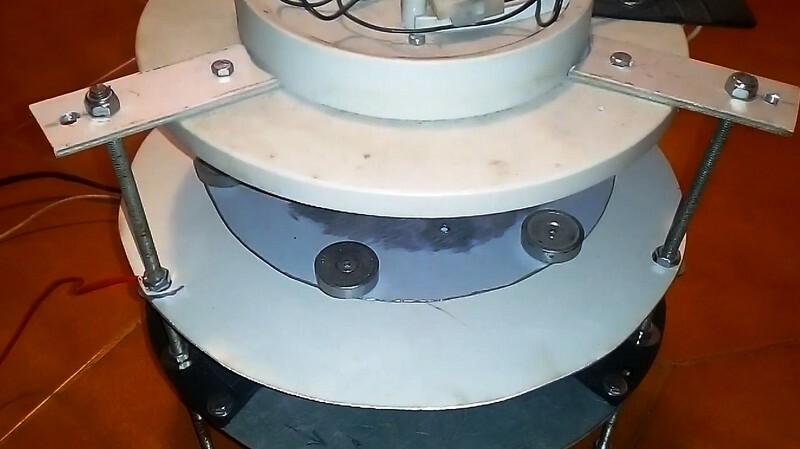 However, If we are setting magnets with bolts-nuts, then it will hold plus make contact. We could add a few layers of Aluminum Foil to get more thickness. Just wonder if it would do the wanted effect...but only trying would tell us. Last edited by Ufopolitics; 09-27-2018 at 12:41 AM. But, as this Replications Process becomes a success (As I know it WILL BE) breaking ALL the Gravitational Laws known so far...I am pretty sure that many ,many more people would start reading from scratch here, Members and Visitors...so, we need to gather together as much info Material as we could, HERE, for future references, in order that EVERYONE could be able to easily reproduce it with success by just reading the first pages of this Thread. If anyone of you guys, Sputnik, Spacecase or Gambeir see any defects/errors on the Diagram, please let me know and I will correct it. Last edited by Ufopolitics; 09-27-2018 at 03:21 AM. I’ve been AFK for a while. My beetle plates are 162mm in diameter, as it seemed to be about the right size for the Neo magnets that I could easily obtain. I think Alexey’s versions might have a slightly larger diameter. I was wondering if six strip magnets might be better, but that might be something to try later on? Sure you might be able to do that. It might be easier to special order some of the plate required though. My plate, 300 x 900mm was $20 from the local hardware store. 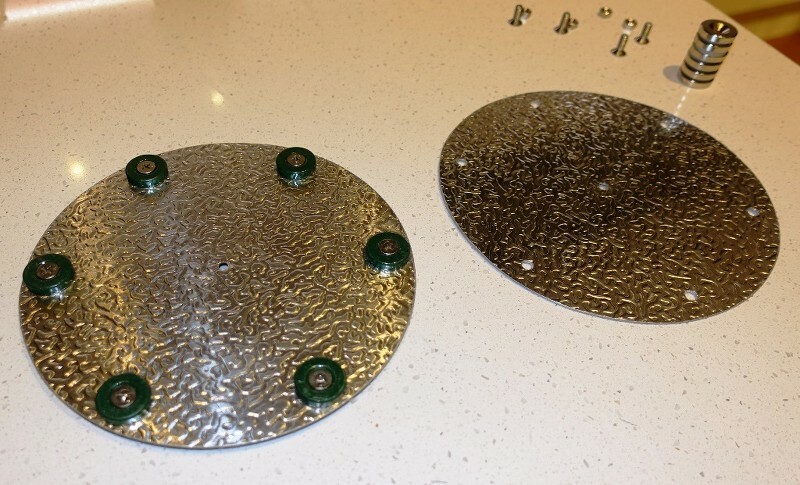 Better yet, it might be good to cast your own (lost foam casting) or other methods of casting your own aluminium discs with impressed patterns, even feature location mounts for the magnets? From what I can see, it is technically accurate, as far as we currently know it. 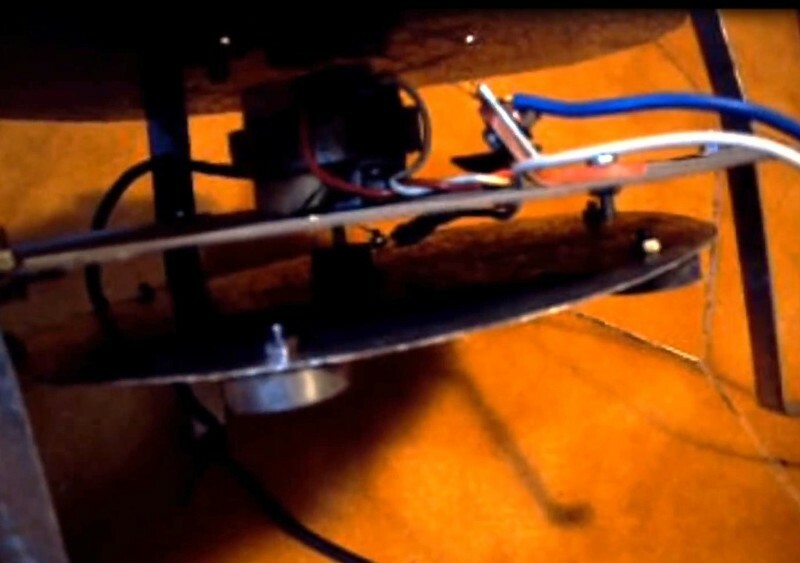 The most recent video Alexey posted, towards the end (four split screen videos for some reason) the lower left one shows him powering up the disc in the field... You can’t see exactly what he does, but we can assume it is switching on the HV DC... – Suddenly the thing lifts up almost instantly and nearly hits him in the face. That little bit of footage provides the best indication so far that this thing is real. Looks great Ufopolitics. However I was adverse to the shafting running all the way through the center, and so I cut out the main shaft running through the middle, then added two Nuts to make the two motor system more visible. I can edit out this image naturally so that you can rework your own image but this is just the sort of illustrations we want. has accomplished and how he accomplished it. Everything seems to fit, looks right, feels right. Speculations on what is going on? Last edited by Gambeir; 09-27-2018 at 03:13 PM. This us about the best way I can answer! Thanks Sputin's, I see what you mean; was enlightening. Last edited by Gambeir; 09-27-2018 at 03:23 PM. In Robert Millikan’s oil drop experiment it says that oil droplets exposed to the ionized air pick up a charge and either rise or fall based on the charge. A conjecture of operation is that there may be an ionized air Bubble Theory of Operation; the AC HV Telsa is attached to a plate which can be a dielectric conductor of aluminum, but which ever material it is made from, sheet metal, aluminum, or other, this plate might be allowing the properties of the magnets to act through the plate to create a separation of charges, inflating the positive charges away and upwards, with the negative charges pulled down and through the plate. Ionized air particles are assumed by the surrounding air and leading to a polarity change above and below the plate. Hmm...Ok, sure you've read this by now, but the idea is to just keep our heads clear that there is a similarity here to lifters and ion craft. However, we now have this addition of the rotating magnetic field and this is evidently significant. Last edited by Gambeir; 09-27-2018 at 08:54 PM. only change is to make the voltage appear in the direction along the rotating shaft. faraday generators are known for low output voltage, so what I have been working on is figuring out a way to boost the output voltage for this layout well into the KV range, and seems not that possible. So could be that is why he added external voltage. So he is converting the static voltage to act like the induced voltage. I just have a question about same deal.. 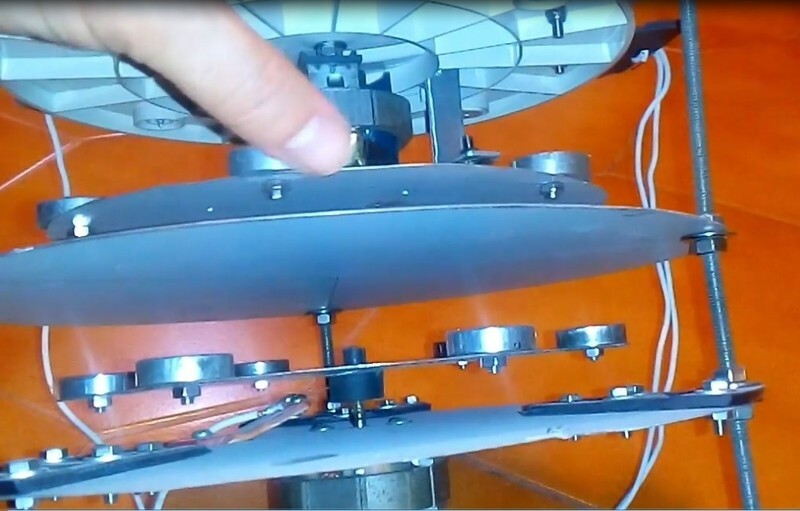 Isn't the AC-HV Center Static Aluminum disc kind of recharging the Static HV-DC Fields which are on each spinning discs? If we get this operation to work in our minds...in every Half Cycle it would be boosting (or inflating as Gambeir said) ONE of these two static OPPOSITE DC fields? Last edited by Ufopolitics; 09-28-2018 at 03:17 PM. 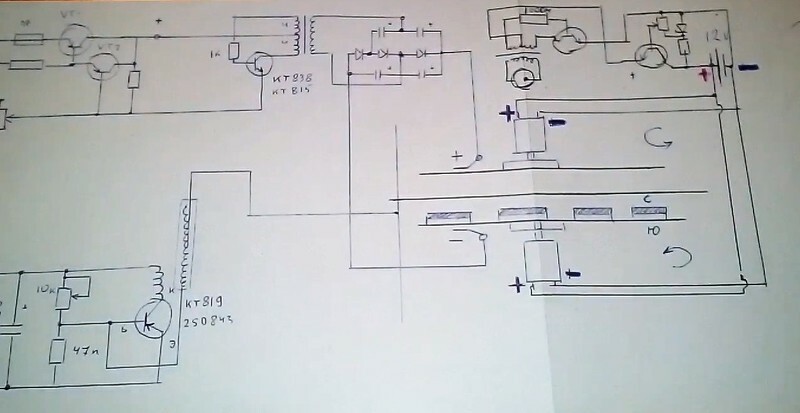 That was my thought entirely: Looking at the N Machine, and Trombly's co-rotating unipolor motor. If this issue is low voltage/high current from ground to the circumference of the spinning disk, why not change the ground reference via a rectifier injecting HF HV to the shaft. Enough to jump a spark gap. The high amperage would then jump with the HV spark that creates an ion bridge for the current to flow (Like EVG motor). This eliminates the need for brushes and reduces the eddy currents? One of my future projects. Our group goal, besides replication, is to eliminate or validate suspects in the mode of operation. It's you people that have the expertise to look at ideas and to validate or invalidate them, or to put them in the unknown unsolved file. I'm not convinced there is any correlation to this idea of an ionized bubble but it is a suspect and we start with the most simple explanations first. A kind of ionized air bubble is going to be offered as the first suspect because it is my belief that is what most will first offer as the explanation for the devices behavior. Now, Mr. Bubble is then related to the ionized vortex suspect Mr. Tornado, and he is related to Mr. Asymmetric. These are some of the suspects I'm seeing. You guys are the technicians, the experts in this specific field, and this is where the knowledge of all of you is required to either validate or invalidate the suspect. By no means do I believe I have an explanation. It's way too early in the investigation for any conclusive hypothesis. If we look at what we are dealing with it is then the elemental parts of Universe. Most likely we are dealing with something suggested by Sputins in his reply to me where Eric Dollard gives his lecture on J. J. Thompsons ideas. All of it is there in this machine so far as I can see, but we cannot leap to conclusions, we have to see if any simpler ideas might work to explain the device, I hope this helps clarify the reasoning behind the conjectures I offer which are undoubtedly going to be ill informed and I just hope you understand and work with them without becoming too annoyed. Last edited by Gambeir; 09-28-2018 at 05:46 PM. think about open VS closed circuit. a capacitor is open circuit (not quite when being charged or discharged). a coil is closed circuit (not quite when you first put voltage on it). maybe the post I made on this was missed before, but it should be in this thread as well. there appear to be 2 kinds of things that show up as voltage on our meters. this device we are looking at intentionally makes and uses some of each kind of voltage, and lines them up the same direction. you can add or subtract the 2 kinds of voltage, if you subtract them equally, you can get something that will read zero on a volt meter, but they will each be there as a separate force if you inspect close enough. the AC voltage on the center disk appears to be adding and subtracting the 2 kinds of voltage. not sure why this part would be needed, but potentially the effect is only momentary. (like the main effect of the electrostatic lifter, most the thrust is right when you power it up). no matter why this part needs done, this device leaves on the induced voltage all the time while alternately canceling the apparent voltage on each disk. going to make the HV DC by rectifying the HV AC. then set any needed ratio with voltage dividers on the AC side with capacitors, or the DC side with resistors (potentially after a voltage doubler). that way I can change voltage, or frequency without changing other parameters. I would just use a mercury jet as the brush. Plasma from an arc is pretty low resistance, but it is going to etch your metal away as it runs. Yes that's true, plasma does this well, but couldn't you use an expendable like a carbon rod to simply? Might that be simpler? I can't say that this is the complete explanation, but I believe "today" that the device is creating a dielectric barrier discharge and which is then creating an asymmetric capacitor thruster. See my post on this in my tread on the ARV. Now how it is doing this has to be related to the spinning magnetic fields, or so I'd imagine, but it isn't evidently creating an ionized plasma as there is no glow coming from it, but am I wrong about that? Didn't Alexey mention something about a glow? Last edited by Gambeir; 09-29-2018 at 02:19 AM. Sputins, what do you prefer; to carry on a discussion here on how the device operates, or to carry that in the ARV thread and to devote this to the actual replication? I feel like you should be the one to make that decision. Significant others what are your thoughts on this as well. What do you folks want? I feel like this question needs aired so I'm not blabbering away where it's not wanted. Right now I'm confident the machine is creating/working off of a dielectric discharge principle, but it's also doing more than just creating a plasma discharge, if it's even doing that and if so possibly not even vectored in the right direction, and so I think the machine is creating a sustained asymmetric capacitor thrust but it might also be doing one or more other things. Last edited by Gambeir; 09-29-2018 at 02:31 AM. 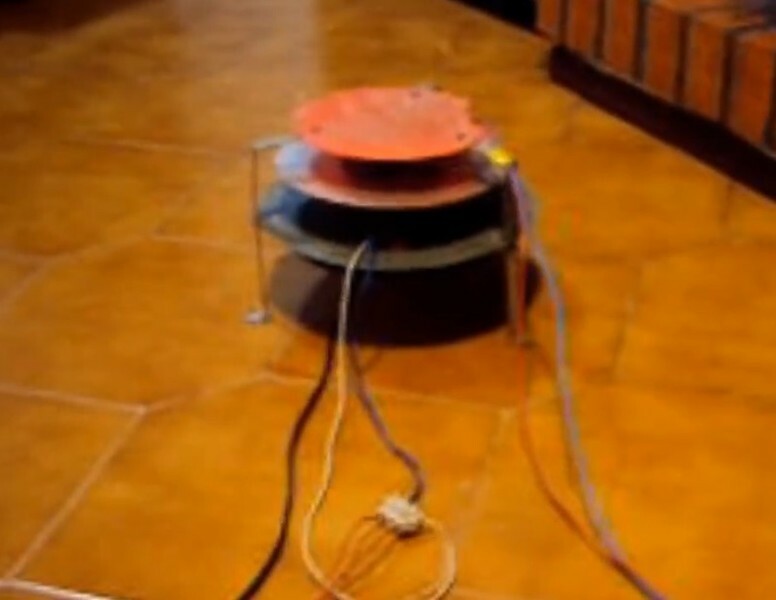 put a high voltage asymmetrical capacitor in a strong magnetic field and sees what it does. That would clear up quite a bit.